While the snow is still on the ground, it won’t be long before the gardens are in full bloom. The herbs will showing off their dazzling array of colors and beauty. Our daily chores, besides weeding, will include harvesting the fresh herbs to dry. Each morning, after the dew has passed we pick each herb by hand, and then carefully dry them. Some are sun dried, while others are placed in the herb dehydrator. Others, like St. John’s Wort, are aired dried for a few hours, and then placed in oil. Let’s take a walk around the garden and learn a little. Besides the bees and butterflies, we’ll see some wonderful healing plants. As we step out the the door, we will first see comfrey. Comfrey is also known as knit bone, as it helps to knit bones together. Comfrey is widely used by herbalists for bruising, sprains and broken bones. While it should never be used internally, a poultice or salve can help to heal broken bones. It is also very useful for cuts, and wounds, as it helps to heal tissue quickly. Be sure the cut is very clean, otherwise infections can occur. 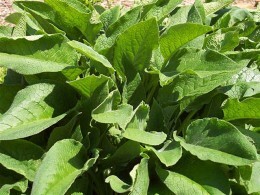 Comfrey helps to heal skin tissues, and is used in many of our skin care products, like Lisepten. Now, we will journey on to the bed of calendula plants. Calendula (Calendula officinalis) is a beautiful orange flower that resembles a daisy. 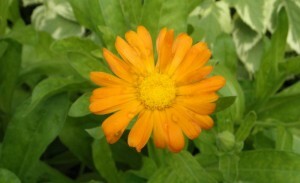 Calendula is grown for it’s wonderful skin healing benefits for humans and pets alike. It’s antibacterial, anti-fungal, and antiseptic properties, makes it one of our top choices for many of our blends of skin healing products. Calendula is a wonderful herb to have on hand for bites, stings, cuts, scrapes and minor burns. Calendula is also edible and delicious in salads. Taken as a tea, it helps with digestion and gall bladder issues. Straight ahead, we have our red clover patch. Red clover (Trifolium pratense), with it’s beautiful purple flowers makes a deliciously sweet tea. The tea is very beneficial to those suffering from menopausal symptoms. It contains phytoestrogens, that can help cool off those hot flashes. The tea is also used to help calm coughs and reduce airway congestion. Chinese researchers have proven that the herb kills certain viral and fungal infections, has an estrogen like function, and is an antispasmodic and expectorant. 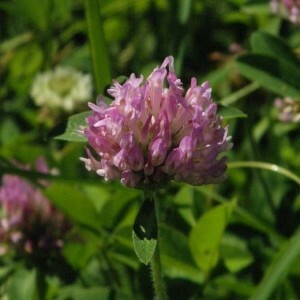 Topically, the red clover oil is very helps to relieve the itch and soreness of eczema and other rashes of the skin. It can be used to help heal cuts. Now, let’s take a stroll to the back garden. Here is where the St. John’s Wort grows. St. John’s Wort (Hypericum perforatum) has a beautiful star like flower that is a vibrant yellow. The flower contains hypericum, which is what gives St. John’s it’s healing benefits. 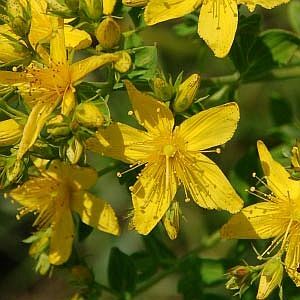 Most people think of St. John’s Wort as a remedy for depression and anxiety, but when the flower, is infused into oil, it makes a wonderful massage oil for sciatica, nerve pain, fibromyalgia and other painful inflammations. The infused oil is also antibacterial, anti-fungal, and a potent anti-viral. St. John’s Wort makes a great wound healing agent for cuts, scrapes and minor burns. It’s anti-viral properties makes it the perfect oil for the Surivon line of cold sore products. St. John’s does interact with many medications, so be sure to check with your health care provider before using it. 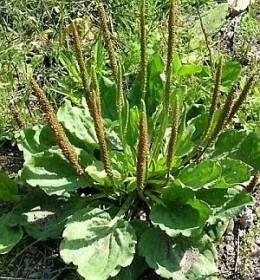 Plantain (Plantago major) is growing wild, and we will pick along the way. Plantain is used for it’s demulcent healing properties on the skin. It is an almost instant itch reliever, and helps to take the “bite” out of stings, cuts, scrapes and other skin inflammations. Plantain is harvested and infused into a wonderful healing oil that is used in many of our products. I hope you have enjoyed just a little tour of our herb gardens.